Having just finished my second year studying Maths at Durham Uni, I was offered a summer internship at Snaptrip. Knowing it was a small start-up, I snapped up (pun intended) the opportunity to work in a business where I could gain experience in a few different teams and therefore get a much better understanding of the overall working of the company. It’s been an amazing and insightful six weeks surrounded by friendly people who are all working hard to deliver an amazing product and I’m so grateful to have had the experience. Here’s a little insight into the kinds of things I’ve been up to, and what it’s like to be a Snaptrip intern! So we’ve all seen those adverts at the top of our Google searches, but I, like many others, had never really given much thought about where they come from. Snaptrip soon changed that by introducing me to the world of PPC. With plenty of data on searches bringing people to the website for me to delve into, I quickly learned the ways of campaigns and key words. This work gave me an insight into how ad groups and campaigns work to help optimise searches, as well as being a brilliant opportunity to massively develop my Excel skills and sort through vast data quantities much more quickly. Another great learning experience for me in terms of optimisation was the SEO writing. As a maths student, writing is something I am rarely able to do and I have wanted to brush up my skills. For anyone not ‘in the know’ (e.g. me circa six weeks ago), SEO is essentially a little boost for Google to make sure they know your pages are worthy of being shown in a search. As well as this, I was given the opportunity to write in the Snaptrip blog about Rock in Cornwall, my favourite English holiday destination. Among the new tools I got to use was Google Analytics. To say I was amazed at how much data about the website’s usage is actually stored would be an understatement. I started off with the basics, learning how to navigate on the site and the kind of reports that can be created from it. I also used the Query Explorer when doing some research into persona breakdown for London vs the rest of the UK. Having experience with this I’m sure will be a great asset in applying for jobs and it’s such a useful tool to track how users interact with a website. Now for the big one – Mode Analytics. Let’s just say when I was told to start tutorials for the code SQL, I wasn’t too confident in how it would turn out. But I’ve had some programming experience in my maths course, so bit the bullet and got down to it. Once the training was somewhat completed (learning code never really seems to end! ), I was set a few simple research queries. As expected, I hit some stumbling blocks but with lots (and lots) of questions, I slowly but surely became more familiar with the language. I was then able to conduct reports for all sorts, from mini tasks that could be used for PR purposes to seeing how our PPC campaigns are performing each week. I’ve gained a lot of confidence in using SQL and am very glad to have been taught such a valuable skill for the future. Other work I’ve contributed is a spreadsheet for Snaptrip to use when conducting A/B tests, showing whether they’re significant at various levels. I then took this further by working out how much a test needs to affect something by for significance for many different sample sizes – hopefully this will be useful for everyone! My first day in the office, it was clear I was going to have a great (educational) time surrounded by lovely, fun, young people in a chilled but productive environment – my ideal scene. The small team size made it easy to quickly get to know everyone well, and I was warmly welcomed and settled straight away. Having everyone in the stand-up meetings every other day was a good way to find out what their jobs entailed and just to generally see what they were up to. The weekly Friday trips to the pub to soak up some London sun were an even better way to chat and become more familiar with everyone! From the stand-up meetings to the office treats to the Friday beers (what’s a start-up without those! ), it has opened my eyes to a forward-thinking kind of business and undoubtedly helped in choosing what kind of career path I would like to go down after I complete my degree. Massive thanks to the whole team for having me and teaching me so much – it’s been a pleasure! 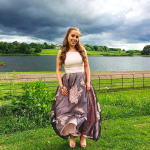 Office newbie and all round cutie, Alice Hugill is currently studying for a Maths degree at Durham University whilst helping out Snaptrip with all our data needs. With a love of Cornwall at her back, she hopes you enjoy reading her bespoke guides!